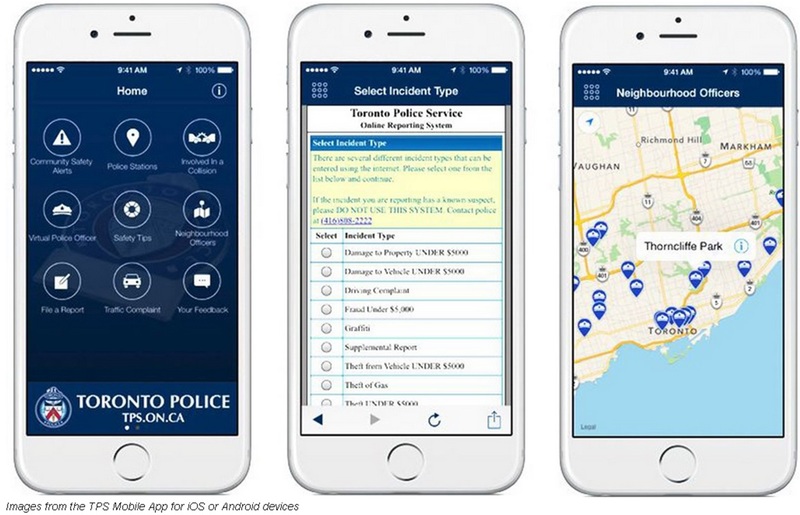 Community Police Liaison Committee CPLC 51 Division: The Toronto Police Service has launched a mobile app that will assist people in non-emergency situations. The Toronto Police Service has launched a mobile app that will assist people in non-emergency situations. Download the new TPS App! The app will let people find police stations closest to them, file police reports to start investigations, whether criminal or for traffic or neighbourhood issues, and connect with neighbourhood officers amongst many other features. “At least 80 per cent of Canadians are connected through mobile devices; most adults use a cellphone in some way, even if it is just to stay in touch with their kids. Most of the under-30 crowd totally rely on smartphones using apps to conduct business, receive their news, their banking and how they communicate,” said Toronto Police Operations Centre Superintended Hugh Ferguson. The Service launched a social media strategy five years ago, with over 300 officers involved directly in some form of social media communications, and an app was the next step. “It makes sense that TPS develop an app where we connect with the public, particularly victims and witnesses to crime,” said Ferguson. To announce the launch of the app, Chief Mark Saunders spoke via video through the app. “The Toronto Police Service would like to hear from you. We need you to report incidents so that we can respond and keep your neighbourhoods safe,” said the Chief. He said the Service was committed to leveraging technology to keep the community engaged and connected. “The app will allow us to send out community safety alerts to you, keeping you informed of major issues, missing persons and other important information. It will provide you with information you may need about crime, collisions, safety tips, our Divisions and our members who are working in your neighbourhoods,” said the Chief, explaining some of the important features of the app. The development of the app was made possible with a grant from the Ministry of the Attorney General and was created by a company called MobilePD, which has also developed apps for other police services across North America. “We have seen, time and again, how enhancing access to services improves public safety and transforms the relationship between the police and the citizens. And we are looking to forward to seeing that result here,” MobilePD CEO and co-founder Kushyar Kasraie said. “We have worked with many agencies across Canada and the U.S., but working with TPS brought us a lot of new requirements and challenges and that was quite exciting for us,” he added. The app is available for download for Android and Apple devices with BlackBerry and Windows coming soon.